Pet odor is a necessary evil in a pet owner’s life. However, you don’t have to sit back and accept it: you can use a pet odor eliminator and breathe easy with a fresh scent in the air. While sprays, cleaners, and baking soda can do some good, sometimes just the light, fragrance, and ambiance of a candle is nice to enjoy. There are so many fabulous formulas for odor elimination candles out there. Scout has found some of the best value and scented candles out there for you to use whenever your home or business needs to be refreshed. For major pet odor control, Scout recommends the Angry Orange Candle Company! Specifically, we love the Angry Orange Odor Eliminating Soy Candles, which pulls double-duty as temper for both pet and general household odors. 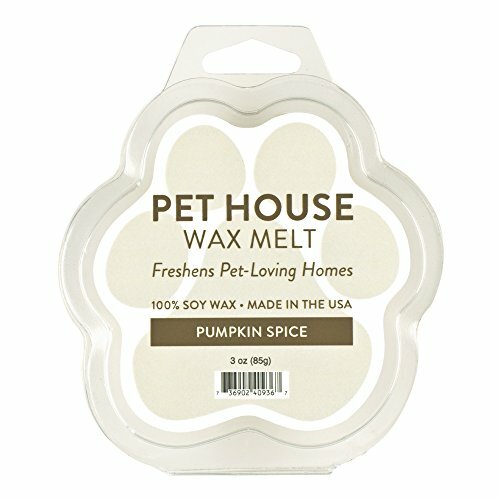 Pet House Candles are simply amazing. Each soy wax candle has a burn time of 60-70 hours and you can choose between 15 different quality scents to match the season or the atmosphere of your home. Apple spice is a great scent for fall while in the summer you may want to try out the amazing Mandarin sage. While this creamy vanilla scented candle is designed to eliminate cigarette smoke and other bad odors, it definitely has the power to refresh even the strongest pet odors. Think about how strong a cigar is in scent compared to your dog? If this value-priced candle can take on that and get solid reviews then Scout is sure it will be great for your home. This candle has a 70 hour burn time and is made of a mixture of paraffin wax and soy waxes. While these candles only have a 40 hour burn time versus the 70 hours of a lot of pet candles, these soy candles are worth every penny because they smell fabulous. Bad odors simply vanish with these candles that come highly recommended by Modern Dog and Cesar’s Way Magazines. Choose from 8 aromatherapy scents such as calming vanilla, energizing grapefruit and spearmint, balancing rose, and relaxing woodlands. You will want to have several of these on hand for when you need some extra help with odor control. Wax melts are pretty popular and these cute paw shaped ones come in a lot of different scents. Use your standard wax melter and you will notice that pet odors simply are no more. The Pet Odor Exterminator Candle comes in so many scents they cannot all be named here. These paraffin candles have about 40 scents to choose from and each candle burns for at least 70 hours yet only weighs 13 ounces so you can put these candles in a lot of places without taking up a lot of space. Each candle is made of a paraffin wax and soy wax blend. 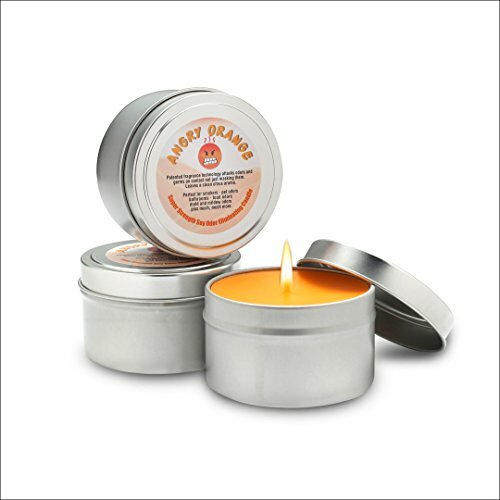 Angry Orange candles are great for eliminating even the most stubborn pet odors out there! You get 3 candles that each burn for 30-40 hours. The tins are nice because you can cover the candle or easily put it away when not in use. These are made of soy wax and vegan-friendly. This 3 pack of odor elimination candles is all you need to experience immediate odor control. 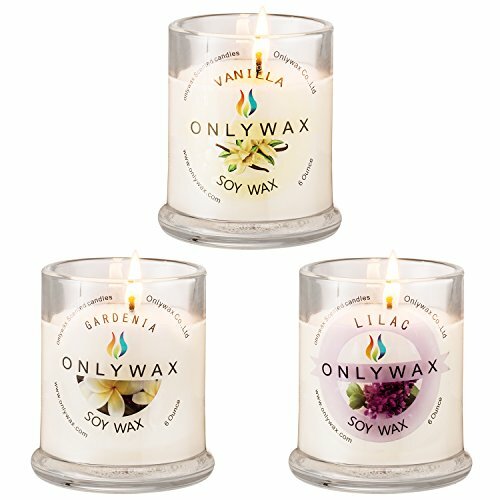 In this pack, you get 3 soy wax candles in 3 different scents. You will love the Vanilla, Gardenia, and Lilac Blossom scents throughout your home. 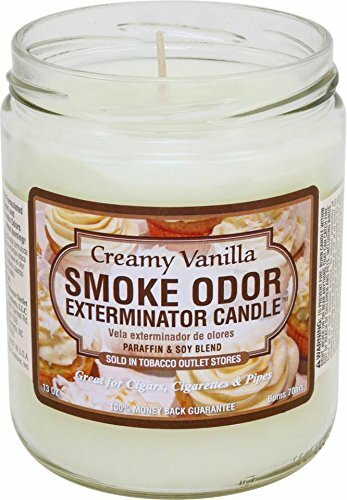 With a 40 hour burn time and a neat vintage looking jar, this is a candle that gets good reviews for general odor elimination, from anything from cooking odors to cigarette odors. The scent is strongly that of cinnamon according to reviewers and it does an excellent job of covering up any foul odors that are around, including tobaco odor with it’s smoke odor exterminator components, and those that drift in from other spaces like outbuildings, neighbors, or garages! This candle is available as a single candle but the best value is the 3 pack. Each 13-ounce candle comes in a mason jar with a handle and burns an amazing 100 hours each! 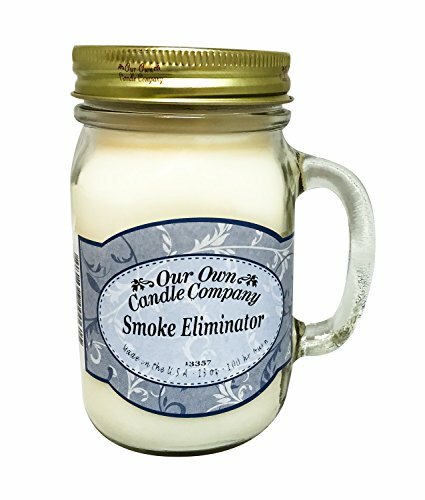 If you are looking for a low cost and effective odor elimination candle then these offer the longest burn time for your dollar of any on our list. The fragrance is described as a fresh linen or just out of the dryer scent and not in any way overwhelming for those that may be sensitive to some scents and prefer the fragrance of clean air. Angry Orange Candles make this list several times for a reason. First of all, there are times when you need a lot of smaller candles like the first ones we talked about from this company. Sometimes you need to bring out the big candles, especially if dealing with a big space or just a stinky situation. If you have been a dog parent for very long at all then you probably have been in a few smelly situations. Our beloved canine family members simply cannot tell us before something has to make its way out. This large candle can take on a lot of smells and leaves a fresh citrus scent and pure air that is hard not to love. 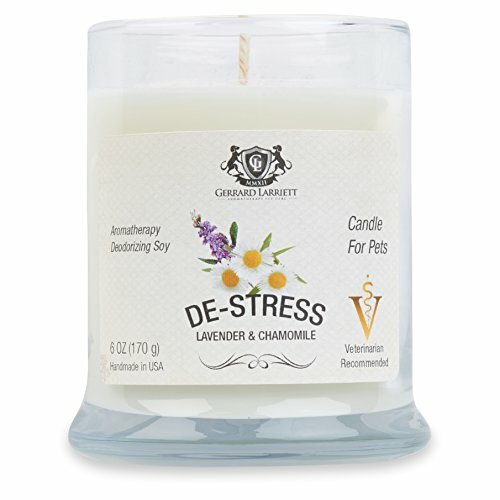 This 13.5-ounce candle has an amazing 85-100 hour burn time and an elegant scent. 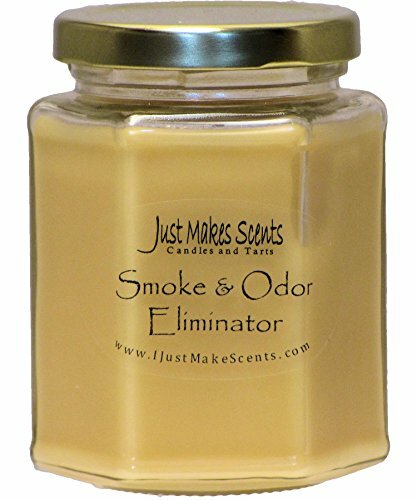 You can buy them in packs of three if you want to stock upon odor eliminator candles at a good price. 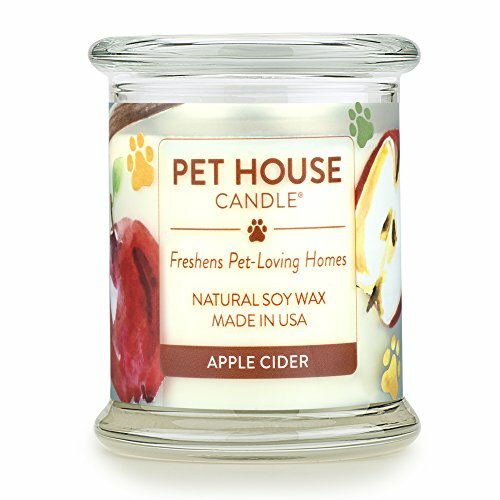 This hand poured in the USA candle is made of soy wax and cosmetic grade fragrances that can take on a lot of smelliness around any pet area. 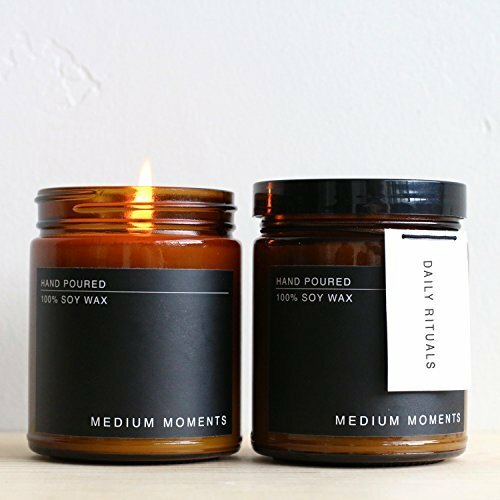 Hand Poured 8 Ounce Soy Wax Candle in Amber Jar, Scented with Green Tea Lemongrass and Lavender Fragrance Oil; Earth Friendly, Long Lasting, Micro Batch; Medium Moments – Daily Rituals 8 oz. These elegant candles come in many unique scent combinations with fun names. This means you should read the scent description before purchase to get the one that is closest to what you like to smell the most in your home. All of these candle scents do an excellent job at taking on any pet odors you may have and you are 100% covered if you order a scent and don’t like what you smell when opening the box. All of these candles are made of 100% USA grown soy wax. Scout likes the fun and unique shape of this candle and the exceptional 150 hour burn time! 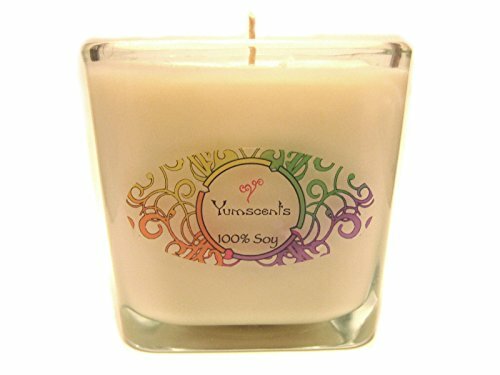 The 100% Kosher Certified Soy Wax is hand poured in the USA. This is the longest single burning candle on our list so if you want to buy a candle for odors and forget about it this is the one to get. Burning for 2 hours per day means 2.5 months of odor elimination which is a pretty good deal for what this candle costs. 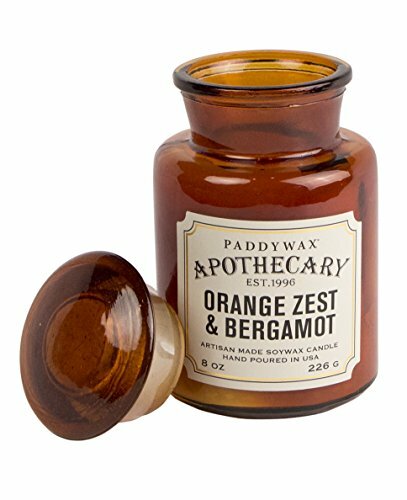 Paddywax Candles have a lot to offer. First of all, they smell fabulous and work quickly to cover up odors and mustiness in any home. Second, they come in a jar with a lid that looks like a curio rather than just another jar candle. These 8 oz candles have a 60 hour burn time. You can get different scents and prices vary based on the scent you choose. 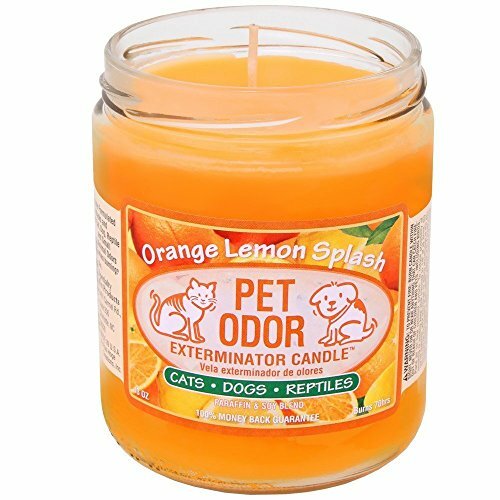 Not all odor eliminating candles are going to be a hit with every pet parent out there. It may take a few candles before you find the one you like the best. Fortunately, candles are not a big investment so if you do buy one that you really cannot stand the smell of you may know someone that can use it anyway. A lot of companies are perfectly fine with you returning unburned candles if you open the box and realize you made a mistake. Candles have some risk involved. 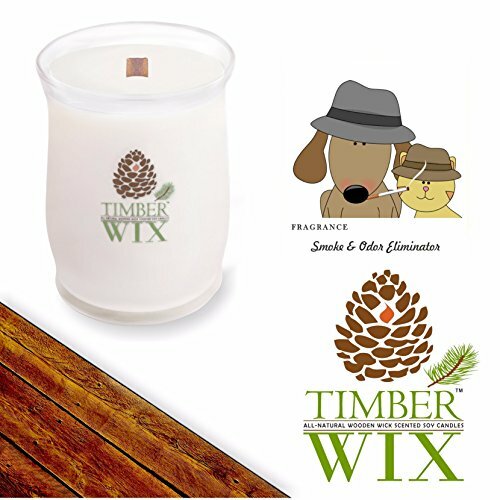 If you are burning an odor eliminator candle then you need to make sure you don’t place it where a pet could knock it over or where a child can reach it. Opt for natural fixers, like baking soda and essential oils or pay attention to the maximum burn time length and go by it. For example, if a candle says to not burn for more than 4 hours at a time, then you should listen. Scout hopes that you enjoy some of the candles on this list and realize the whole world of options you have when it comes to dealing with the toughest pet odors!